An unlocked iPhone 4 officially going on sale at Apple in the US? Might have sounded like just a rumor yesterday, but today that's already a reality. 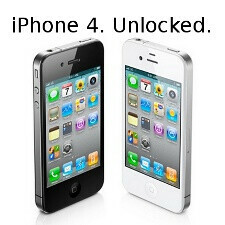 Apple has launched sales of an unlocked GSM version of the iPhone 4 at its online store. The phone comes in both black and white with the price for a 16 gig model set at $649, while the 32GB version will set you back $749. The handset is a quad-band GSM (850/900/1800/1900MHz) device with support for WCDMA 850, 900, 1900 and 2100 MHz bands. This means that it would work on some 3G networks in Europe and Asia, but since it doesn't support T-Mobile's 1700 MHz WCDMA bands, it won't support T-Mo's 3G network. If you opt for the white iPhone 4, though, be prepared to wait a bit more as it shows as shipping within 3-5 business days, slower than the 1-3 business days it takes a black iPhone 4 to ship. You shouldn't forget that the iPhone 4 requires a micro-SIM card, so – as Apple warns you – you should get one from any supported GSM carrier across the world. From there on the setup is pretty straightforward - you just have to register on iTunes and you're good to go. Finally, in case you still want to use it with AT&T, but without the ties of a 2-year agreement, some simple calculations show that you'd be better off getting the locked iPhone 4 which runs at $199 for the 16GB version. Even if you pay the full $325 early termination fee, you end up paying a total of $524., much less than the $649 Apple charges for the unlocked version of their handset. Update: As some of you have pointed out, in case you decide to save a buck by getting a subsidized locked model and subsequently trying to terminate your agreement, you'll also end up paying for activation ($36) and first month service, so your total will be a minimum of $614.99, much closer to the price for an unlocked iPhone 4. Victor, $199 is the 2-yr. agreement price for the iPhone 4. It's $599 w/o agreement. I am an AT&T employee, and box is correct. The no-commitment price was increased by $50 earlier this year and matches the prices for these unlocked models. Also, the cost for buying a subsidized model is more complicated than just $199 + $325. You will also be responsible for the $36 activation fee and the first month of service, as the account can only be cancelled within the first 30 days with the return of equipment. So, minimum, 199+325+36+39.99 (voice)+15(data) = 614.99 + taxes. You do come out a little ahead. Thanks for mentioning the activation and service fee, aricept! We've factored those in and updated the article. Who? WHO for the love of God i ask you are these tards paying $650 for a unlocked 16gb iphone 4. It's crazy as hell but you know what, they'll sell millions. Suggesting someone would be "better off" by submit to a credit check, wasting a sales reps time and costing him or her commission by signing up for a 2 yr contract then deactivating service within the first month just to save a few dollars on a phone is unethical and irresponsible journalism Victor H.
Reps dont make commission on iphones. I know I dont care if an iphone deactivates. Not affecting me at all.. wooo a $7 chargeback. I probably would make more on the comission from the accessories I would put out with it. Big Deal. HUGE waste of money for last year's outdated tech!! soo , if i buy a unlocked iphone 4 & can it go with metro pcs ?